STORRS, Conn. (AP) Add 100 consecutive wins to the UConn Huskies’ long list of milestones. Given the team’s glitzier numbers linked to national championships, 11 titles and counting, it may seem ho-hum with no added significance. Geno Auriemma’s squad already owns the longest winning streak in Division I college basketball history. UConn beat its own record of 90 consecutive wins earlier this season with little fanfare. Getting No. 100 was a little tougher than many of the previous 99, which UConn won by an average 38.7 points. Gabby Williams scored a career-high 26 points and Napheesa Collier added 18 to help the top-ranked Huskies beat No. 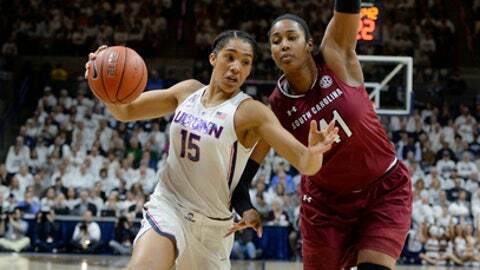 6 South Carolina 66-55 on Monday night in front of a sellout crowd of 10,167 that included past greats Sue Bird, Maya Moore, Tina Charles and Breanna Stewart, who helped the Huskies to the first 75 wins of this streak. The current group of Huskies (25-0) had to work for this win. South Carolina (21-3) used its stellar interior game of A’ja Wilson and Alaina Coates to take a 29-28 advantage late in the first half. The Huskies responded scoring the final seven points before the break. Collier and Williams had all of them, including a steal and layup by Collier with 3 seconds left that made it 35-29. South Carolina cut its deficit to 40-37 midway through the third quarter, but Williams had consecutive layups to start an 11-2 run to close the period and basically seal the win. ”We just tried to stay poised and keep our composure, and just be more confident than the other team,” Williams said. After the game ended, fake hundred dollar bills dropped from the roof of the arena with Auriemma’s face on them. The student section spelled out 100. Auriemma never thought his team would come close to reaching the century mark, let alone break the previous record set by the Huskies from 2008-10. The Hall of Fame coach set up the most difficult non-conference schedule in the country, playing five of the top eight teams in the AP before Monday, including road games at No. 2 Maryland, No. 4 Florida State and No. 7 Notre Dame. UConn came away victorious in each one. The game against the Gamecocks may be the Huskies’ last challenge before the NCAA Tournament. They are 75-0 in the American Athletic Conference since joining in 2013. Considering they most likely won’t leave the state of Connecticut until the Final Four in Dallas with the first two rounds on campus and then a regional in Bridgeport, the streak may not end anytime soon. UConn: This was the Huskies 10th game this season against a team in the current Top 25, but only two of those games have come since Jan. 1. UConn faces one more ranked opponent, when they visit No. 22 South Florida to close out the regular season. … Of the 100 games, 59 have been decided by more than 40 points. Only two (Florida State and Maryland) were fewer than 10-point wins. South Carolina: The Gamecocks came into the game scoring an average of 77 points a game and giving up just 54.9. The Gamecocks came into the game 5-0 against ranked opponents this season. … They were 0-4 against UConn. KISS THE RINGS: It was alum night for the Huskies. Joining Bird, Stewart, Moore and Charles were Kalana Greene, Caroline Doty, Asjha Jones and Morgan Tuck. Bria Hartley, who just gave birth a few weeks ago to her first child, also was in the crowd. Rebecca Lobo was in Gampel Pavilion as well, working for ESPN. CHASING 131: UConn is still short of the overall college basketball record for consecutive wins. The Wayland Baptist women’s basketball team won 131 straight from 1953-58. It wasn’t the NCAA back then, it was the AAU. STRUGGLING SAMUELSON: Leading scorer Katie Lou Samuelson had a game to forget. She missed her first eight shots before scoring her first points with 6:54 left in the third quarter. She came into the game averaging 21.4 points and finished with just six points on 2 for 12 shooting. ”Any of us have an off the game, the rest of the team will be there to pick us up,” Collier said. South Carolina: The Gamecocks head back home to face Vanderbilt on Thursday night.